The "Mesolithic" also known as "The Middle Stone Age"
As the glaciers melted, the climate warmed rapidly and the vegetation changed from open Arctic tundra to forest cover. Into this new environment came many of the animals we know today such as red deer, roe deer and wild pig as well as some that have become extinct in Britain such as wild cattle, bears, wolves and so on. Following these herds came the hunter-gatherers of the Middle Stone Age, many of whose camp sites have been found locally. These sites, which must have been used year after year, can be located by the large numbers of flint tools and waste flakes such as those found at Oakhanger. The changed habitat is reflected in a change in tool types used by these hunters. 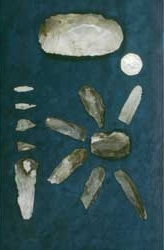 No longer needing large handaxes, a typical Middle Stone Age toolkit consisted of smaller flint flakes used as barbs on arrows, for saw teeth, for piercing skins, as well as scrapers, burins and a type of axe known as a tranchet. These types of tools are amongst the commonest finds from the heathlands in the Whitehill/Bordon area. More general information about this period is shown under the map. The Younger Dryas ended around 11,500 years BP (about 9500 BC) and the Holocene, a geological epoch, began (at 11,700 calendar years BP), and continues to the present. By 8000 BC temperatures were higher than today, and birch woodlands spread rapidly. Rising sea levels caused by melting glaciers had cut Britain off from Ireland by about 12,000 years ago, whereas the land bridge between Britain and the continent lasted much longer. The plains of Doggerland were thought to have finally been submerged around 6500 to 6000 BC, but recent evidence suggests that the bridge may have lasted until between 5800 and 5400 BC, and possibly as late as 3800 BC. The warmer climate changed the Arctic environment to one of pine, birch and alder forest; this less open landscape was less conducive to the large herds of reindeer and wild horse that had previously sustained humans. Those animals were replaced in people's diets by pig and less social animals such as elk, red deer, roe deer, wild boar and aurochs (wild cattle), which would have required different hunting techniques. Tools changed to incorporate barbs which could snag the flesh of an animal, making it harder for it to escape alive. Tiny microliths were developed for hafting onto harpoons and spears. Woodworking tools such as adzes appear in the archaeological record, although some flint blade types remained similar to their Palaeolithic predecessors. The dog was domesticated because of its benefits during hunting, and the wetland environments created by the warmer weather would have been a rich source of fish and game. It is likely that these environmental changes were accompanied by social changes. Humans spread and reached the far north of Scotland during this period. Sites from the British Mesolithic include the Mendips, Star Carr in Yorkshire and Oronsay in the Inner Hebrides. Excavations at Howick in Northumberland uncovered evidence of a large circular building dating to c. 7600 BC which is interpreted as a dwelling. A further example has also been identified at Deepcar in Sheffield, and a building dating to c. 8500 BC was discovered at the Star Carr site. 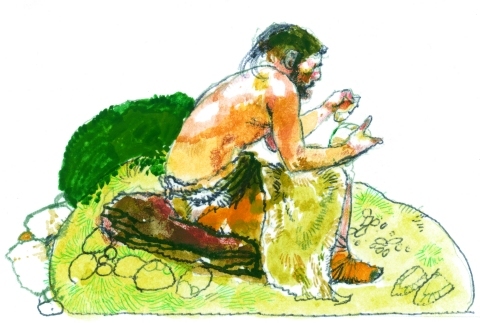 Though the Mesolithic environment was of a bounteous nature, the rising population and ancient Britons' success in exploiting it eventually led to local exhaustion of many natural resources. The remains of a Mesolithic elk found caught in a bog at Poulton-le-Fylde in Lancashire show that it had been wounded by hunters and escaped on three occasions, indicating hunting during the Mesolithic. A few Neolithic monuments overlie Mesolithic sites but little continuity can be demonstrated. Farming of crops and domestic animals was adopted in Britain around 4500 BC, at least partly because of the need for reliable food sources. Hunter-gathering ways of life would have persisted into the Neolithic at first but the increasing sophistication of material culture with the concomitant control of local resources by individual groups would have caused it to be replaced by distinct territories occupied by different tribes. Other elements of the Neolithic such as pottery, leaf-shaped arrowheads and polished stone axes would have been adopted earlier. The climate had been warming since the later Mesolithic and continued to improve, replacing the earlier pine forests with woodland. In 1997, DNA analysis was done on a tooth from a Mesolithic Cheddar Man from about 7150 BC whose remains were found in Gough's Cave at Cheddar Gorge. His mitochondrial DNA was of Haplogroup U5, a subclade of Haplogroup U (mtDNA) found in only 11% of modern European populations, suggesting he (and maybe his clan) had migrated to Britain from outside of Europe.